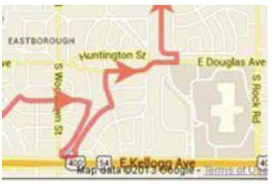 The race course and some approaching streets will be closed from 6:15 am - 10:30 am on Saturday, September 28, 2013. We will have your streets reopen as soon as it is safe to do so. Thank you for your support and cooperation! 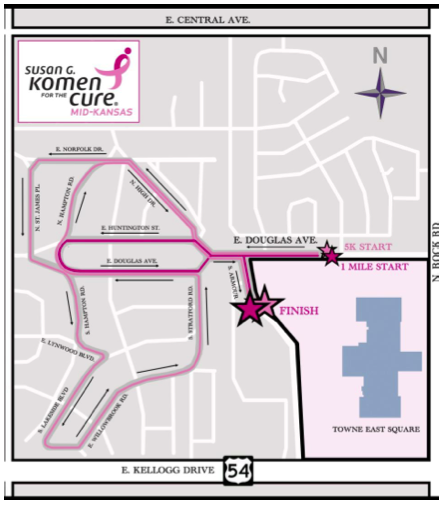 Thank you for allowing Susan G. Komen Race for the Cure® to use your neighborhood. You are part of the Cure! The City of Wichita's specifications designate the fescue sodding season as September 1 to November 1. The contractor will need to prepare these areas by destroying any annual grass and weeds, then cultivating/pulverizing soil to a minimum depth of 2". Removing any large stones and fertilizing at a specific application rate. Areas shall have been graded to allow sod placement to match adjacent curb/pavement and existing lawn elevations. It is my understanding that the contractor is moving towards Eastborough South, and should be there very soon. I will try to get a definitive schedule, which I will share with you and ask that you may relay to others within the community. We will continue to update you with any information that we receive. As you have undoubtedly noticed with all this great rain we have been having, there are quite a few places on our streets where there is standing water much of the time. The cause of this issue is that years of overlay and repairs have altered the flow patterns such that water can't always get past intersections in order to get to where it needs to go in order to completely drain. We've been working with our street consultant to identify these areas and come up with a plan to repair them. Beginning next month, we will be installing new valley gutters across six intersections in order to fix these drainage issues. These valleys will resemble the one that was installed last year at Mission and Huntington which fixed one of the worst of these problem intersections. These repairs should be relatively quick but we will need to close one end of several intersections for a few days in order to install the new valley gutters. With these new gutters in place, these new "lakes" should shortly be a thing of the past. Nothing out of the ordinary to report. The rain we have enjoyed so far this summer has been a blessing. I am not sure I have ever seen the grass so green in our fine city. In addition, the other blessing is our lower water bill! The zoning request from Towne East square has been put on hold by Towne East management. The Wichita MAPC asked them to come up with a comprehensive landscaping plan to meet their original zoning requirements as well as satisfy the neighboring residents concerns. The City of Eastborough will once again host the Race For The Cure on Saturday, September 28, 2013. This is a very worthwhile event that gives us the opportunity to give back to the community at large while showcasing our wonderful city. If you are on the race route event organizers will place a reminder notice on your door knob just prior to race day. Not all residents will be affected, but access in and out of Eastborough will be limited. 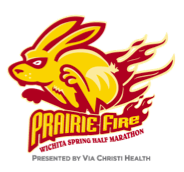 If you have the need to leave and/or return to your home on that morning, it is recommended you move your vehicle outside the city limits away from the race route on Friday night or before streets are closed at 6:30 a.m. on Saturday. The race should conclude just prior to noon and streets will reopen. If you have special circumstances, please contact the Eastborough Police prior to race day for their assistance. Get out and cheer the runners as they pass your home! I want to remind new residents and others to provide us with your email address in order to improve our communication with residents. In addition to normal newsletters, there may be an occasion that warrants a special alert to some or all residents. I would like everyone to welcome our recently hired Police Officers to the community. Officer Cody Brua was hired on May 13th. He is currently working night shift from 7:00 PM to 7:00 AM. Officer Kevin Dorritie started with us on July 8th and Officer David Halverson started on July 22nd. They both work the day shift. Officer Razeeq took over the vacant swing shift from 1:00 PM to 1:00 AM. I had to suspend the bicycle patrol when the department was shorthanded. I am pleased to announce that Officer's Razeeq and Dorritie are now assigned to bicycle patrol and will be out as much as possible, weather permitting. I also designed a new patch for our uniforms. The one I replaced has been in use since 1992. I feel the new patch design is more personalized and unique to the City of Eastborough. In the past, Officers had a patch only on the left sleeve. Our new patch is on both sleeves. This gives our uniforms a more balanced look and easily identifies our officers to the public. There has been no significant activity in our city to report, but I would like to remind everyone to stay alert to any suspicious persons, vehicles or activity in our city. If you see anything out of the ordinary do not hesitate to dial 911. It's been a abnormal year to say the least. The growing season started a little dry and warm which was a problem on top of the water line project that rendered the irrigation at the duck park inoperable. As such, we did not get to over seed or get plantings going. Since then we have been fortunate to receive huge amounts of rain and below average temps which has really helped in most areas. And now, we are back to the dry and heat. Crazy summer. The unfortunate aspect of these rains has been washouts of ground cover, mulch and even some damage around bridge areas. We now have to address these areas and look for long-term solutions that are cost effective yet attractive. Both waterfall pumps were damaged during the rains but both are operating again. We did redesign the small one to help extend the life through making it less likely to have debris enter. While we have fewer geese than two years ago those we have continue to be destructive and intrusive. In reality this is going to be a problem that all we can hope to do is minimize. Parks like ours come with water and water comes with geese. Geese come with problems. The city is very limited in what we can do because of federal protections for waterfowl. We continue to seek solutions but must be sure that those explored are effective and economically viable, as well as legal. We do have some good leads and one of our own officers is developing a plan. The front lawn of city hall and the West islands will be over seeded this fall. However, we will wait until Spring to address the South park area with the belief that we will be able to reduce the goose population thus giving the grass a better opportunity to take. You will notice that all other park and common areas have many new plantings this year. In addition to enhancing the look of these areas this has been a step towards providing more lower maintenance areas in the future. In 2014 we should be able to cut back on plantings and the maintenance required to preserve these areas. We must be aware that because we have so many mature trees we will continue to see tree loss and thus it is necessary to sequence replacements. Please do not hesitate to contact me if you have any thoughts to share regarding our park and city areas. A portion of the Marathon Route enters Eastborough. They enter off Woodlawn south of Douglas, continue around Eastborough Park and then run on Douglas going East. They do not completely close streets, however they do put cones on one-half of the street to protect the runners. Please look for runners and cheer them on!! They will appreciate you clapping for them (I think they should be about 8-9 miles into their 26.2 mile run).